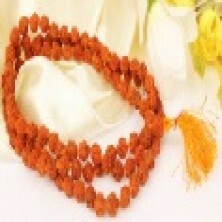 Mala of medium sized five mukhi beads of size 7 mm in thread knotted in traditional style, and tassel. Maybe used for wearing on neck or Japa. Five mukhi rudraksha is worn for health and peace of mind Mala is commonly used for Japa of all mantras .